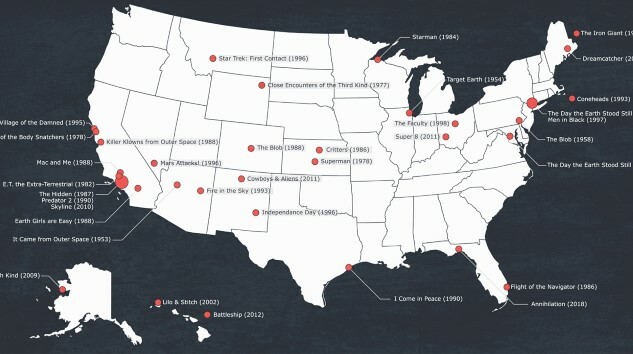 Fans of science fiction know that the U.S. has been visited by cinematic aliens on any number of occasions, but you still might be surprised to see just how many times in visual form—and just how spread out around the country they’ve been. 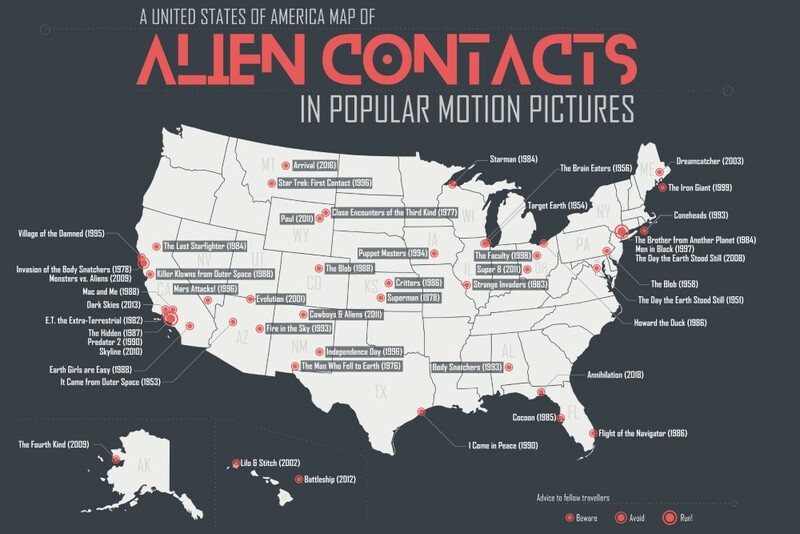 Today, we’ve been given the opportunity to illustrate this point with the lovely little map below, which depicts the cinematic “first contact” points from more than 30 alien movies. The image comes courtesy of a hard-working redditor Dylan_Mq, who posted this revised version of his infographic to the primary film subreddit, r/movies. As Dylan_Mq details in his accompanying post, this second version of the graphic has been updated with more accurate locations, as well as additional films. In order to make the list, the alien encounters had to be of a singular or solitary nature—thus, worldwide invasions such as Signs or The War of the Worlds do not appear. The leading city appears to be L.A., although it’s interesting just how spread out all the points of contact really are. And we can’t help but be pleased to see the appallingly bad likes of Mac and Me, right next to E.T. in California where it belongs. You can expand the infographic below by clicking on it. Are there still some omissions that could be added in future revisions? Naturally. The world of sci-fi/horror B-movies offers far more random alien films that could be added to the list, including the likes of The Galaxy Invader, Xtro or Nightbeast, among others—not that many fans would bemoan their absence. Perhaps a few years from now, the map will be completely filled in, with no more room for additional aliens? We’ll just have to wait and see.